In 1993 a group of mostly African-American comics creators banded together to form Milestone Comics, an independent imprint of DC aimed at creating an ethnically diverse cast of heroes and villains. The Milestone characters crossed over with the proper DC Universe here and there, but dwindling sales led to their cancellation and virtual disappearance from publishing. Remarkably, one Milestone character, Static Shock, got his own television show, and today Milestone exists mostly as a media licensing company that manages Static Shock. With improving the ethnic diversity of the DCU a major goal of the New 52, Satic Shock himself is an ideal candidate for incorporation into the DC Universe proper. DC lacks a high-profile modern-era electricity manipulator, and the character’s high-school age and witty battle banter gives DC a character that ticks the “Spider-Man” boxes better than any in their stable (they even moved him to New York City for this incarnation, making him even more like Spidey). Plus he’s black, he’s got comparative mass media exposure, and if this comic is anything to go by, he’s a pretty fun character. 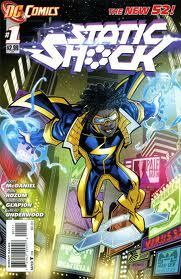 I’ve never read a Static Shock comic, so I came into this one fresh and with an open mind. Generally, I’d say the creative team rewarded my curiosity with a fun story about young Static and his adventure with a rogue experiment that got loose from S.T.A.R.R. Labs, and later with a related team of politically connected schemers and their super-powered goons. Both the script and the art provide a nice exploration of Static Shock’s powers. There’s a lot more to this guy than shooting electro-rays out of his hands and causing blackouts. Static is something of a science prodigy, and he uses the science of electricity to do all sorts of imaginative tricks. Using his “plasma gloves,” he creates a tether of pure energy to ensnare and reposition a villain. Later, after the man is shot by an unseen, distant assassin, Static tracks the bullet to its source by tracing the trail of its kinetic energy as it transferred itself to air molecules through friction and heating. Although I liked the way Scott McDaniel drew Static’s powers and told a clear story with his visuals, I simply didn’t care for his drawing style. Certain elements, like “popped” trenchcoat collars, rekindle memories of similar 1990s atrocities, and don’t exactly leave readers with the impression that Static Shock is a fully modern comic. Something about the visuals in this book (and I think the coloring is a big part of it) seems appropriate to the previous generation of comic art, rather than the present generation or even the next generation. That said, Statick Shock #1 stands up to repeated readings, and offers plenty of promise of future interest, including more ties with the Milestone continuity suggested by Static’s mentor Hardware, as well as plenty of hijinx sure to follow Static on his internship at S.T.A.R.R. Labs. A fun book, with lots of promise hindered a bit by art that I just can’t quite get into. Still, adding Static to the proper DCU seems like a no-brainer, and I’m pleased to say I think they pulled it off nicely. The whole reboot screams 90s; kind of heartbreaking. I have hopes for Static though!